Robert II, King of Scots and grandson of Robert the Bruce was a handsome, charming man who had many descendants. He not only had two wives who had numerous children but many mistresses who had babies as well. In fact, we will never really know how many offspring he had because the annals only name his male illegitimate children and none of the females. Due to these many progenies and some questioning the legitimacy of his children by his first wife, conflict over who should accede to the throne of the Scots would last for eighty years. Let’s take a look at Robert’s two wives. 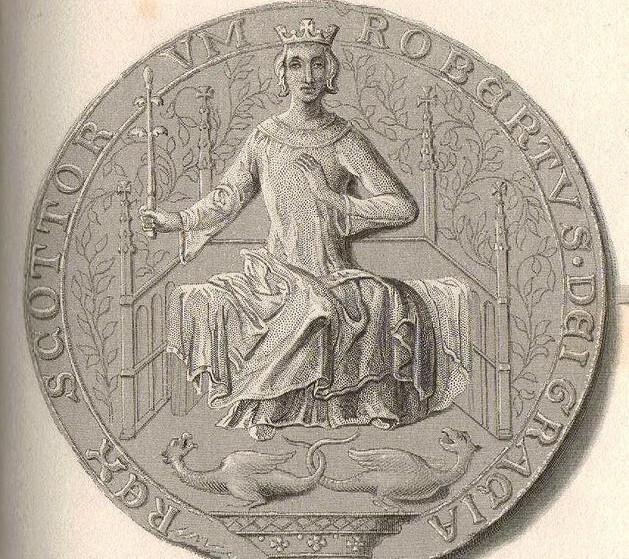 The seal of Robert II, King of Scotland. Elizabeth Mure is a shadowy and elusive woman due to the lack of surviving historical record. The best guess of when she was born is 1320. She was the daughter of Adam of Rowallan in Ayrshire. When Elizabeth was probably sixteen and most likely pregnant, she was hurriedly married to Robert Stewart. Robert was the son of Marjorie, the daughter of Robert the Bruce and of Walter, the sixth High Steward of Scotland. Robert was good looking, congenial and liked by all. Many wished he was king. Robert carried out a feud with his uncle, King David II and was able to sabotage or limit David’s powers as king. Robert stood next in line to the throne if David had no children, which he didn’t. Robert was to have anywhere from nine to thirteen children with Elizabeth, including at least four sons. With his growing family, Robert married his daughters into powerful families and worked to advance his sons. Through this familial network he managed to gain control of the greater part of central, western and north-eastern Scotland by unions with eight of the fifteen existing earldoms as well as other lordships, royal castles and offices north of the Forth-Clyde line. For some reason, in 1347, Robert felt he needed to legitimize his marriage to Elizabeth and they sought a religious dispensation. When he applied for the dispensation from the pope, he was supported by King David, the king of France, the seven Scottish bishops and parliament. There is some speculation as to why the couple did this. Robert and Elizabeth may have discovered they were related in the fourth degree which was prohibited by the church without dispensation. Elizabeth might have been related to another mistress of Robert’s and they may not have known this when they married. Elizabeth may have been Robert’s mistress and they didn’t really marry in the first place. Or they may have had a marriage in the secular, Celtic tradition which wouldn’t have been recognized by the church. Pope Clement VI, the fourth Avignon pope, granted the dispensation and Elizabeth and Robert went through a formal marriage ceremony. Although all their children were legitimized by this process, the children of Robert’s second marriage would always question their legality to inherit the throne of Scotland. Elizabeth died in 1353, possibly in childbirth in her early thirties. She was buried either at Paisley or Scone. Her eldest son, John Stewart, Earl of Carrick would eventually succeed to the throne upon the death of his father as Robert III. Euphemia Ross was the daughter of Hugh, 4th Earl of Ross and his second wife Margaret Graham. She was born sometime between 1322 and 1330 and most likely was brought up at Dingwall Castle in northern Scotland. The Ross’s lived far from court but her father was a friend of King Robert the Bruce and had been married to Robert’s sister Maud as his first wife. Euphemia was betrothed as a young child and the marriage was most likely arranged by the king. She was to marry the King’s great-nephew John Randolph, second son of Thomas Randolph, 1st Earl of Moray. This match would unite two of the most important families of the north. Thomas Randolph died of illness and John’s elder brother was killed in battle. After the battle, John inherited his father’s title and escaped to France. Euphemia’s father was killed at the Battle of Halidon Hill in July of 1333. John returned to Scotland and was named as Guardian of the country for King David II along with Robert the Steward. John and Robert soon quarreled as they were both young and ambitious. This guardianship was dissolved in 1335 and Sir Andrew Moray took over. About the same time, John was captured on the Borders by the English and after being captive in various castles was taken to the Tower of London. He wasn’t set free until 1341 and then he went to France. He returned to Scotland in 1343 and he and Euphemia were finally married. Her husband had a castle at Darnaway in Moray and estates in Dumfriesshires so this is probably where she spent her time. During her marriage to Randolph she had no children. In 1346, her husband, Robert the Steward and King David II crossed the border into England and fought at the Battle of Neville’s Cross. John Randolph was killed and Euphemia was a widow and wealthy landowner and would remain so for the next eleven years. Euphemia knew Robert the Steward well as he had made up his quarrel with her husband and their families became friends. She may have been attracted to Robert as he was tall, dignified, handsome, and affable with charming manners and a lover of pretty women. Euphemia may have been interested in Robert and Elizabeth Mure’s young children. Euphemia may have been attractive to Robert due to her landholdings in the north. There was an agreement that they would marry. Euphemia and Robert were related within three degrees of affinity. They sought a dispensation and received one from Pope Innocent VI, the fifth Avignon pope, on May 2, 1355. Euphemia’s uncle, the Lord of Lovat and a grand retinue accompanied her south to her wedding which may have taken place at Robert’s castle of Dundonald in Ayrshire. This castle was most likely her home. She would come to have many children of her own. Her first son was named David after the King, her second son was named Walter and she had at least two daughters, Jean and Egidia. As mother to her own children, stepmother to her husband’s older children and manager of her husband’s estates during his absences, she was exceedingly busy. She would have attended masses, supplied charity to the poor, supported the local clergy, managed her own property and may have visited her family in Dingwall. After sixteen years of marriage, Robert became King of Scots in 1371. Euphemia was crowned in 1372 at Scone by Alexander Kinninmonth, Bishop of Aberdeen a few months after her husband. They moved to Edinburgh Castle. Like most medieval queens she would have encouraged and patronized the arts. Robert had mellowed greatly from his rash youth. He maintained agreeable relations with England and sustained good relationships with his nobles due to lavish gifts and his affable personality. The kingdom was for the most part at peace during his reign. He had a lot of trouble with his many offspring fighting amongst themselves, especially the children of Elizabeth Mure. It is not known how Euphemia got along with her stepchildren but there is evidence she worked to promote the interests of her own sons. With determination and preserving influence, she managed to get the earldom of Caithness for her eldest son David in 1377. David also inherited the earldom of Strathearn from her directly. He began to claim he was the rightful heir to the throne, renewing the age old question of the legitimacy of his stepbrothers. We don’t know if Euphemia supported him in this endeavor. By 1384, Robert was weak and nearly blind. His eldest son, John, Earl of Carrick took over most of his duties as King and Robert retired to his castle of Dundonald. Euphemia died in 1387. Robert died three years later. They were both buried at Scone.